1. 7 fresh tomatoes (4 slices each). 2. 50 asparagus spears, canned or fresh and cooked. 4. 25 leaves of leaf or romaine lettuce. 5. 1/2 7 ounces can pimientos. 2. 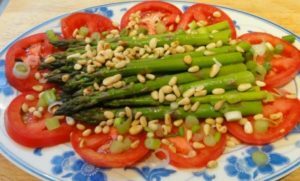 Place a slice of tomato in the center of each salad plate and two asparagus spears on top of the tomato. 3. Cut the pimientos into 25 strips and lay one strip across the asparagus, garnish with a sprig of watercress or parsley. 4. Serve with any type of dressing desired. 1. 5 pounds(lbs) frozen green beans. 2. 8-ounce onions, cut julienne. 3. 1 pound(lb) bacon, cut julienne. 4. 7 ounces can pimientos, cut julienne. 6. 1 teaspoon garlic, minced. 7. 25 leaves of romaine lettuce. 9. 1/3 cup chopped parsley. 1. 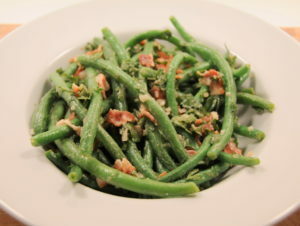 Cook the frozen green beans in boiling salt water. 2. Drain the beans and let cool thoroughly. 3. Blend together in a mixing container the cooked beans, garlic, onions. pimientos and French dressing. Let set for at least. 4. Cook the Julienne bacon strips into 2 hours, crackling. drain and let cool. 5. Line each cold salad plate with a leaf of lettuce. Sprinkle on the shredded iceberg lettuce. 6. Place a mound of the salad in the center of the plate. Sprinkle the bacon crackling over the top.